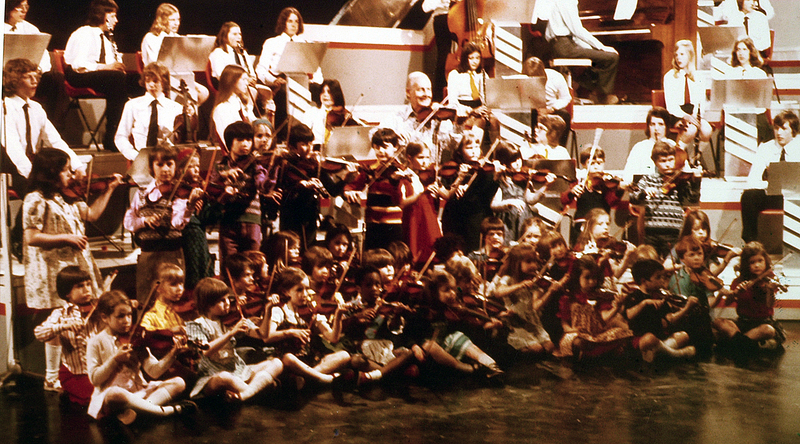 Stephane Grappelli on ‘Roy Castle Beats Time’ with The Suzuki Children. I met Stephane the day before this photo at ‘Pebble Mill at One’ – with Diz Disley and John Etheridge – he was riding high with a new Hot Club Trio and platinum selling albums with Yehudi Menuhin. I’d always been a fan of the original 1930’s HCQ line up with Django Reinhardt. He wanted somewhere to warm up and I took him to Studio 1 which was empty as usual! – he was in seventh heaven. He had just acquired his wonderful Galiano violin (he had never had money before!) he played non stop for the next two days and refused to stand under the notoriously hot Pebble Mill lighting in case the Galiano dried out – this caused big problems as he stood in the gloom. The next day for Roy Castle the producer had prepared a surprise – ‘The Suzuki Children’ came on as a treat and formed a circle around Stephane playing their tiny violins. Stephane was very moved and wanted a souvenir photo – I rushed off and found a freelance who took the snap. Stephane gave me his address and I posted it to him. Astonishingly he wrote back! This was the beginning of a friendship of 20 years. I eventually wrote his biography, produced a one hour feature for BBC Radio 2 and directed a three hour DECCA DVD ‘A Life In The Jazz Century’ which was nominated for a BAFTA in 2002. When we cleared Stephane’s Paris flat in 1997 the photo was still amongst his souvenirs. Pebble Mill was full of surprises! I was one of the Suzuki children. I remember the day really well. It was very exciting to be at Pebble Mill. I also remember how lovely Stephane Grapelli was. I am standing in front of him in this photo and he patted me on the head with his violin! We went next door to our neighbours so we could watch it in colour. It is amazing to see this photo -we had one of Roy Castle, but there has been no other way to share the experience with my family .